Liv Life: Peanut Butter Chocolate Chip Banana Muffins, Guest Duo Bakers and a Giveaway! I don't win things very often. Try as I might that lotto ticket has never had more than 2 matching numbers and someone else is living in my dream house in French Polynesia. I did however hit the right number in Jean's, Lemons and Anchovies, recent CSN Store giveaway for a $50 gift card! As thrilled as I was to win Jean's giveaway, I'm even more thrilled to announce that the CSN stores have offered a $45 giftcard for us to give away! With easy online access and thousands of items to choose form, the CSN Stores is a perfect place to get a head start on your holiday gift shopping without having to leave the comforts of your own home. Have guests coming in town for the holidays? You can easily spruce up your guest rooms with new upholstered headboards. Need a new mixer? The CSN Stores have it! Or how about treating yourself to a new Nespresso Coffee and Espresso Machine? To enter the giveaway we are not asking for anything other than a comment letting us know what activity helps you to Liv Life in a better way! The contest will close as of noon, Pacific Standard Time, Sunday, November 21, 2010. 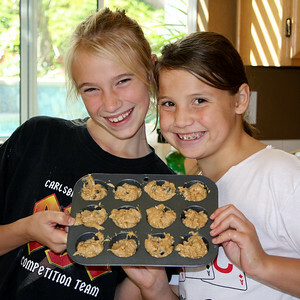 With our new hand mixer ready to go, Liv and her friend Molly decided to put together a healthy snack. As dancers, they know the importance of getting the proper nutrients into their bodies to keep up stamina, build muscles and to stay healthy during their intense competition dance season. Still, they were wanting a treat, so we found something in the middle. Peanut Butter Chocolate Chip Banana Muffins have been a neighborhood favorite for nearly 10 years. The little mini muffins have made appearances at birthday parties, Girl Scout meetings and sleepovers. Gobbled up in minutes, the kids have no idea that these special treats are actually Mom approved! 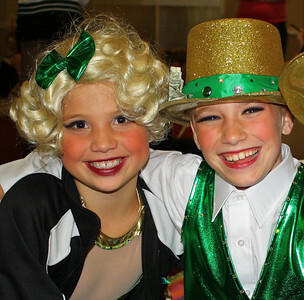 Liv and Molly are ready to hit the stage! 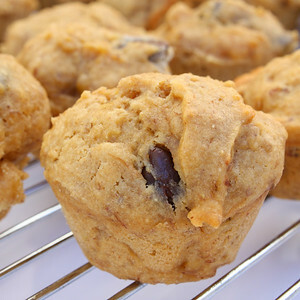 Made with whole wheat flour, a few tablespoons of ground flax meal and packed with bananas, these popular muffins give much needed fiber as well as potassium and other important vitamins and minerals. Combined with protein-rich peanut butter, the bananas and their "healthy sugars" give the dancers a lasting energy boost to get them through their rehearsals. Dark chocolate chips are added, first, because they taste good, second, because they lend a dose of healthy antioxidants to the mix. Vanilla flavored Almond Milk is used to make these dairy free for Liv's lactose intolerant brother - regular milk or any milk alternative are also options. Make sure to have all ingredients and equipment ready, and don't forget to preheat your oven! Don't throw away those yucky, brown bananas! They are super sweet and flavorful. Don't put the mixer on too high when you start or you will splatter your friend! That's it! Thanks for participating. Liv, Molly and I are looking forward to your comments! Preheat oven to 350º. Spray mini muffin tins with cooking spray. The batch makes about 40 mini muffins. In a large bowl stir together the flour, flax meal, baking powder, salt and cinnamon. In a medium bowl mix the milk and water with the sugars, banana, peanut butter, vanilla and egg. Add the chocolate chips to the dry ingredients and stir to evenly distribute. Add the wet ingredients to the dry ingredients, stirring just until combined, making sure not to over-mix. Spoon the batter into the mini muffin tins and bake for 13-16 minutes, or until muffins are lightly browned. Alternatively, bake into mini loaves at the same temperature. Begin checking for doneness at about 30 minutes... baking time will vary depending on the size of your mini loaf pans. Remove to a wire rack and cool. Enjoy! Cute, cute post. Love your guest bakers! It might sound cliche, but running helps me "liv" life in a better way. I've only recently become a runner and I love it, AND it makes me healthier. What could be better? omg how fun this must have been the picture paints a thousand words for sure, the next generation of bakers, its so refreshing to see this next generation for sure taking interest! I love this post....CSN is a favorite of mine, I need so many things with my new kitchen! love this giveaway! The muffins are perfect in color great job here! 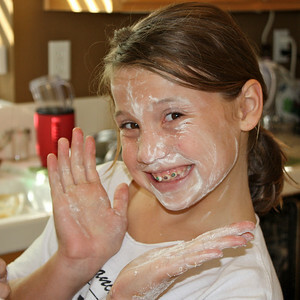 What an adorable picture covered in flour...that's pretty much how I look when I bake, except sometimes I'm covered in batter instead of flour :lol:! What helps me live life better? My collection of bubble baths...after a busy day at work or in the kitchen, I love nothing better than a nice hot bath full of good-smelling bubbles! Adorable pics, can I just say how impressed I am that they are touching the ripe bananas!! My girls are completely grossed out by them, until they are baked into a delicious bread! lol My fav way to Liv life better is definitely cooking and baking with my girls, I love the different convo's we have together! The only thing sweeter than those muffins are your guest bakers!!! You should have them on again soon! Thanks for a great post! What a fun time they had making muffins! Thanks for sharing such cute pictures. The muffins turned out looking mighty tasty, too. Peanut butter + chocolate chips + bananas = yummy explosion in my mouth!! YUMM. I liv life in a better way by making vegan bakes when I'm out of milk, butter, and eggs. Wink, wink! These sound pretty good...ok VERY good and I think I need to try this to see if I can get some picky eaters that come visit to eat without a fuss! I liv a better life by volunteering at a local animal shelter. I love helping out my 4 legged friends! Cooking helps me liv life better. It's therapeutic. 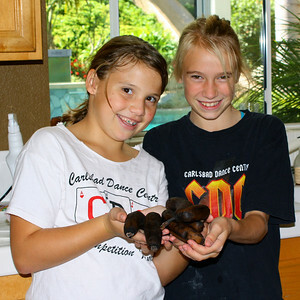 Great post and cute kitchen helpers. The muffins sound delish! in life that is truly important. Love the pictures of the kids - looks like that 'free' mixer is a hit! Thanks for sharing the recipie. Being in the moment makes me live a better life. Whether it be cooking for family/friends or just taking my dog for a long walk, regardless of the weather; enjoying "that" moment. Nice muffins, and love all the pictures. That's a memory those girls are gonna keep! My kids help me live my life better! I can't imagine what life would be like without them and I'm glad I don't have to! I absolutely love baking with my sisters and friends. 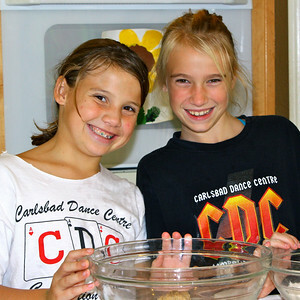 It's a memory we share and have fun talking while we bake. Life is good. Love the pictures! Making sure I get enough sleep helps me live life and also getting enough cuddles with my sweet husband! 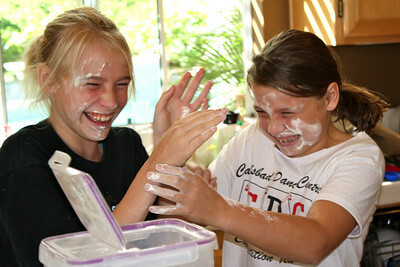 What great photos of the girls...the future bakers! Also love the costumes and all the photos. They are all so cute, smiling, and happy. Priceless photos, and yummy muffins...thanks for sharing a precious part of your life! Taking my dog on a walk helps me "liv" a better life. Going to the dog park always makes me smile! Great giveaway. I know it sounds hokey, but volunteering makes my life better. Your little bakers are so sweet, love the pictures and love the recipe. Honestly, a good run helps me 'liv'life better. Sounds like a delicious recipe. Cute pics! Lov the post and the muffins too. Great job young ladies. Baking cookies helps me liv life in a better way. It's a great strss reliever, and calms and soothes me, that simple act of forming the cookies and laying them out on the plate. I do love cooking for and with my family! I also like playing games with them. The actitivty that helps me to Liv a better life is exercise!! And of course cooking!! Coffee! I can be a grump in the morning (can we all) and it helps me go from grouch to productive in only 5 minutes. I'm a better person with coffee. Caffeine. Caffeine enables me to "liv" at all most days! a long run every morning! These muffins look AMAZING! I am probably going to make them tomorrow! Running is my drug of choice-- exercise endorphins = amazing. I just found this blog recently from tastespotting and I must say everything looks delicious... the photos are gorgeous as well! I find that there's nothing like taking my dog to the park to play fetch to help me live life better - he gets SOO excited over just the prospect of heading out to the park, it really reminds me that it's the little things that matter the most! I love your recipes.. I also really like your guest post.. Everything is so helpful on your blog!! Ok, so I waited until after I was sure the contest was over to write because I just want to tell you that the girls are adorable. What an incredibly sweet post. It's a keeper. The girls look like they had a lot of fun! One activity that helps me live life in a better way, is learning to be a great cook. I'm running my own house now, learning how to cook from scratch and greatly enjoying it. I know its improving our lives because the food is natural and healthier! I love to take care of my goats. They keep me moving and they make me laugh. Baking is my stress reliever! OMG This was so cute!!!! Will definitely give these a try!!! Taking a break and doing something fun with the family helps us to live life in a better way. Our schedules are beyond busy, so a much needed family break is always beneficial. They look like they are having so much fun! I try to Liv life in the moment by making mundane chores more fun for the kids and I. Racing to pick up toys, dancing while we mop, singing while we fold laundry. 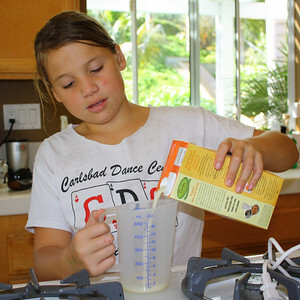 Doing anything with my kids and husband just makes me happy - I especially enjoy cooking with my kids! Great photos! My liv better moment is when I workout. It makes me feel like I accomplished something for the day and I feel great about myself afterwards. 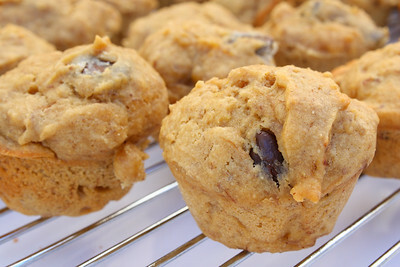 Love the recipe and pics...banana chocolate chip muffins are a favorite in our house! Making sure I exercise for at least 20 minutes a day makes me feel like I am "liv"ing better! Yummy! Cooking and baking for the holidays helps me liv better. It makes me feel good to have homemade goodies on hand. Liv Life better for me is being outside all I can, with the family. I like to spend as much time as possible with my family! I like to spend time in the kitchen with my family...cooking and baking and talking and laughing together. Doesn't get much better than that! Hi, reading to my daughter every night helps me Liv Life in a better way! Thanks so much for the giveaway! Eating a balanced diet and exercise helps me Liv a Better Life! I decided to be come an aerobics instructor because my work ethic is much better than my "go to the gym everyday" ethic. This has definately helped me to live better! Looks like they had fun! I love spending time with my husband and daughter..it helps me liv life better. I LOVE to cook and LOVE to cook for my family. I believe that what you do with all your heart n soul is done with Lots of Love and should be shared with the ones you LOVE!!! That's how I LIVE LIFE to it's fullest. Every two weeks, unless one of us can't make it, I meet with two Christian friends. Together we chat, pray, and read a book about Christian living together. These meetings sustain me, encourage me, and challenge me...and help me to live life better! If you have kids and have trouble keeping up with the clutter this is THE article to read. First article I've read about cleaning that didn't make me feel insulted or hopeless, but actually did some good! Lately, my Active 2 workout game for PS3 has been helping me live life better. I've been sore but it's worth it! Baking helps me live life better (although the result doesn't necessarily add to my life span!) --I find it both relaxing to do and rewarding to look at and enjoy the finished product. I try to spend more time with my kids doing the little things.